On Tuesday March 25th, 4th and 5th grade students at Arroyo Seco Elementary School in Livermore engaged in an interactive cultural dance experience. 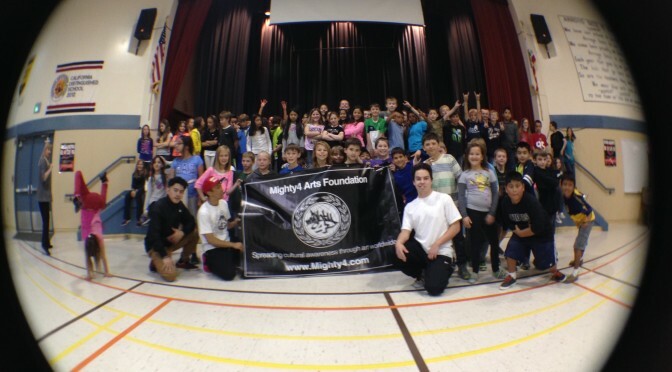 A Union City based non-profit organization, Mighty 4 Arts Foundation, which teaches Hip Hop cultural art forms, taught beginning breakdancing assembly workshops that included stretching exercises, techniques in breakdancing, and a “cypher” dance circle. Children learned music, dance, history and culture. This Mighty 4 Arts Foundation outreach project was in partnership with the City of Livermore’s Commission for the Arts, under their Art in the Schools program.